LinkExchange SearchMe WhatWeDo AboutUs Sitemap Next page During drying, onions go through six different phases. During drying, onions go through six different phases. 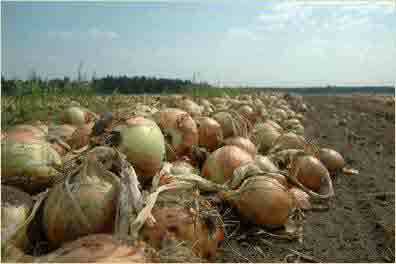 Onions in the field, ready for storage. The processes required to store onions properly. These processes are controlled by the Multiserver from AgroVent systems BV. It is best to dry onions at between 25 and 30° Celsius.. The Multiserver programme for drying onions will ensure that the turbines work the maximum number of hours to extract moisture from the onions as quickly as possible, whilst maintaining the temperature between 25 and 30°C, and the relative humidity between 60% and 65%. In doing so, the aim is not to dehydrate the insides of the bulbs, but rather the 3 or 4 outer layers which separate the bulb from the outside. This process is completely controlled by the Multiserver, which constantly searches for the mixture of air with the highest drying capacity, by managing the doors, turbines, heaters and condensers. To prevent the cells in the bulb from being destroyed. To ensure that the centre of the bulb is at the same temperature as the outer layers. This is why the Multiserver has two special programmes to control the heating or cooling of the produce. Onion storage specialists advise cooling or heating the onions by 2 degrees per day at the very most, and recommend only 0.5 degrees per day. Such a slow change in the temperature of the onions has important consequences when planning to move the onions from the storage facility. Let's assume that the onions are stored at 2° Celsius. The destination of the onions is 25° with 85% relative humidity, making the dew point 22.3°. This means that the onions must be heated by at least 20.3°, to 22.3°. At the maximum allowed increase of 2° per day, this process will take at least 10 days. These days must be kept in mind when planning the onion delivery. Especially in hot and humid climates, if the onions are not heated above the dew point, many of them will rot in the humidity. Crispy skin and a juicy middle. The onion must be the right variety for storage. It must be harvested when it is completely physically ripe. The bulb must be firm and compact. The skin must be strong. The bulb must have a low water content. It must be grown to Good Agricultural Practices. It must not be fertilised with nitrogen during the last 6 weeks of its growth. It must be applied sufficient amounts of aglime. Onions can be stored at two ranges of temperatures. The onion, postharvest, is still alive. This means that it continues to respire. All plants give off water when they respire. The more they respire, the more water they lose, and losing water means losing weight, which is the last thing we want during the storage process. Below is a graph indicating the relationship between the storage temperature and the intensity of the onion respiration, reflected in the weight (water) loss percentage over 5 months of storage. Onion respiration with relation to storage temperature. 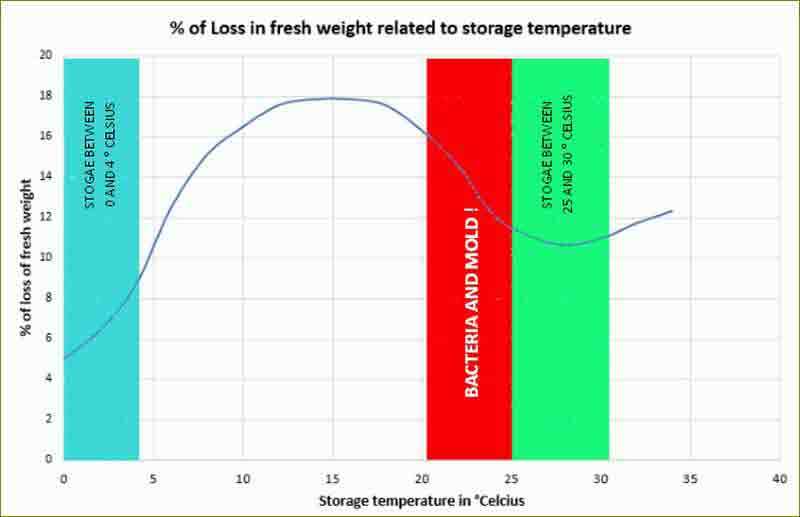 The intensity of onion respiration is reflected in the percentage of weight (water) loss over 5 months of storage, with relation to the storage temperature. 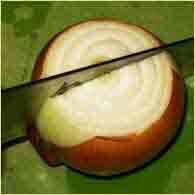 The temperature range between 20 and 25° Celsius is very dangerous for the onion. 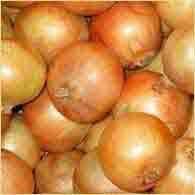 It is inside this range that bacteria and fungi, enemies of the onion, are most active. Below and above this range, they remain inactive. The graph demonstrates that within the range from 0 to 4° Celsius, weight loss is considerably less than within the range from 25 to 31° Celsius. On top of this, between 0 and 4° Celsius, onions can be kept healthy and suitable for storage for up to 12 months. Between 25 and 31° Celsius, they can be kept healthy and suitable for storage for up to 8 or 9 months. However, when deciding at which range of temperatures to store your onions, you must bear in mind the local climate during storage time. In a climate where the temperature varies between -10° Celsius and 15° Celsius it is much cheaper to cool your storage facility to between 0 and 4° Celsius. Less energy is wasted on keeping it cool. 2)	Hot or tropical climates. In a climate where the temperature fluctuates around 30° Celsius it is much cheaper to heat your storage facility to 25 to 31° Celsius. Less energy is wasted on keeping it at the right temperature. Another consideration is storing onions between 25 and 31° Celsius in the tropics. As soon as an onion at 2° Celsius is exposed to humid air at 30° Celsius, it becomes moist. When removing the onions from storage, they must be heated up to the outside temperature. This requires great energy and a lot of time. 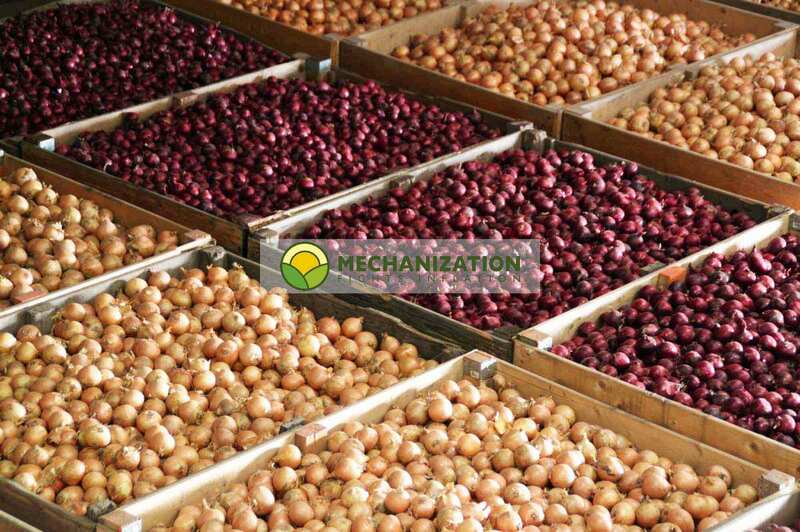 Meanwhile, onions stored at 30° Celsius can be removed immediately without the risk of moisture. Relative humidity must be constantly kept between 55% and 65%. The temperature must remain constant; temperature fluctuations must be avoided during storage. Bulbs must be kept in darkness. Whenever a light is switched on inside the storage facility, the onions in the light (on top of a pile) will react as if they were in direct sunlight, and start to sprout. Please note: The onion bulb will lose significant weight through respiration (the bulb is still alive) if it is stored between 5 and 25° Celsius . The range between 20 and 25° is particularly dangerous because bacteria and mould thrive at this temperature. During storage proper, ventilation must be kept to a minimum, because the onions are already dry (dry means dry!) and we do not want them to lose more weight through respiration, no matter how little that may be at this temperature. The little ventilation required is to avoid an increase in CO2 levels, and to eliminate the heat which the onions generate as they continue to respire slowly. Next up: During drying, onions go through six different phases. 1. From 0 to 4° Celsius. This is the optimal temperature for onions which are to be stored for anywhere up to 12 consecutive months. The main disadvantage of this low temperature (especially in the tropics!) is that the onions take many days to heat up above the dew point at their destination. If this heating is done improperly, the entire batch will absorb moisture and a significant amount will be lost. 2. A good alternative, especially if the onions are being stored for less than 8 or 9 months, is to keep them at a temperature between 25° and 32° Celsius. At this temperature, the bulb stays alive but barely respires, and so doesn't lose any weight.